Typical Thanksgiving food does not tempt my tastebuds or my tummy. Turkey? It had a face. I'm not eating that. Tofurkey? 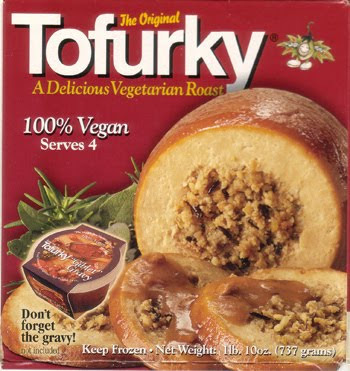 How about NOfurkey - gross. Stuffing? Dry and eww. Yams and/or sweet potatoes? Gag. Pecan pie? Not my fave and oh-so-fatty. Green bean casserole? I wonder why anyone would defile vegetables in that manner. Brussels sprouts? Meh. Pumpkin pie? Maybe a few bites. Mashed potatoes? Hold the gravy. I'm super-thankful that The Alamo Drafthouse opens its doors on Thanksgiving. After Chad and I do the Turkey Trot fun run to benefit Caritas, and after our nap, we're headed to the only place where Chad can get a traditional turkey dinner while I dine on salad and veggie pizza as we watch the latest box office hit. Hooray! 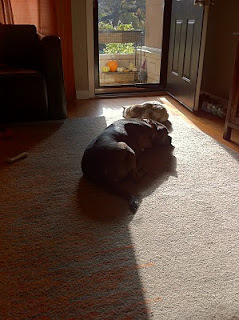 Kenji and Janie like each other, but they LOVE a warm, sunny spot. Chad sent this photo to me last week. (I was still asleep when it was taken.) It made my day. I have the post-Halloween blues. Halloween is my favorite major holiday. (All of you who prefer other holidays, go ahead and freak out. To each their own.) Now that I've carved pumpkins, dressed up in a costume, eaten more candy than I should have and watched lots of fun, scary movies, I'm left feeling a little blah, like my aura has turned dingy-beige. Perhaps this is a prolonged post-sugar-rush crash, perhaps a touch of pre-seasonal affective disorder, but I feel less than shiny-happy-sparkly. The thoughts that put a pep in my step involve the kittens that I and other volunteers care for at Austin Pets Alive. Feeding these little fuzzballs, snuggling these miniature purr-monsters and even cleaning up after these mobilized happiness-spreaders makes me feel better. I can't hold a pudgy, purring kitten and be unhappy at the same time. These states are mutually exclusive. More than any other volunteer activity I've ever done, caring for kittens warms my soul. Find a volunteer activity you love. The pay is amazing! Play with the Murder Mystery Players! All of our public murder mystery shows include delicious dinners, fun prizes and a heaping helping of murder mystery and laughter! ONLY $36.95 per person plus tax and gratuity. Plenty of free parking! You won't get that downtown! 512-346-8015 ext. 12106 for reservations. Reservations required.